Description: A repaint only for the payware Warbirdsim product 'Mustang Tales'. 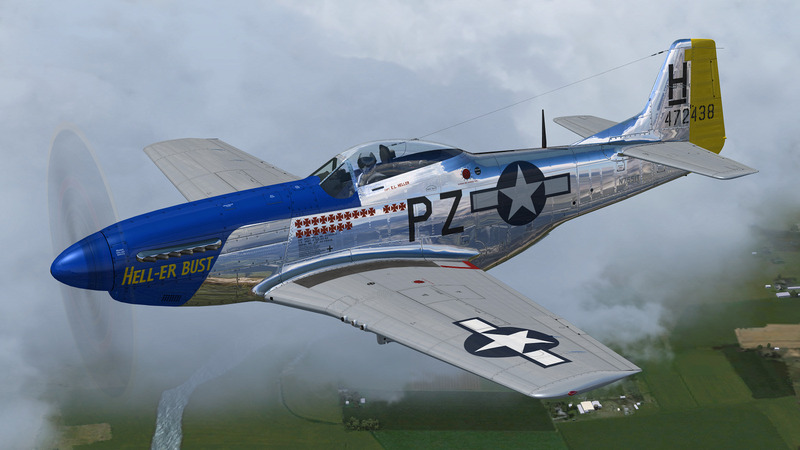 This repaint depicts the restored P-51D-20-NA 44-72438, "Hell-er Bust", registered N7551T. This specific aircraft is known to have been delivered to the 8th Air Force in England in late January 1945, however no available records indicate any combat time or what, if any, Fighter Group the aircraft was assigned. Following the end of WWII the aircraft served with the Swedish AF as Fv26131, and then with the Dominican AF as FAD 1920. After being imported back into the U.S. in the 1980's, the aircraft was purchased by Selby Burch and given a ground-up restoration. Finished in 118th TRS markings, the aircraft won the Grand Champion WWII Warbird award at Sun 'N Fun 1997. The aircraft was later purchased by Bob Jepson/Lady Alice Corporation and first repainted as 'Lady Alice' and then as 'Hell-er Bust'. In 2006 the aircraft was obtained by the Historic Aircraft Foundation and based at Paine Field, near Seattle, WA. Since 2009, the aircraft has been owned by Mark Peterson/Mustang High Flight LLC, based at Boise, Idaho, and remains finished as 'Hell-er Bust'. The markings depict an original wartime mount of Lt. Col. Edwin L. 'Ed' Heller, a P-51D-10-NA (44-14696) of the 486th FS, 352nd FG. This repaint features new bump maps, wheel well, gun bay, and cockpit textures. Just wondering if I am seeing things but looks like oxygen mask with modern helmet? How is that done? Thanks Greaaatt repaint! !